"And 'groids' is a stupid name!" When one wakes up with the desire to really get to grips with disembowelling your friends and colleagues, one should properly arm one's self with an army of murderbots ready to pursue, maim, and slaughter indiscriminately. Professor Runcible has proven especially proactive in this regard. 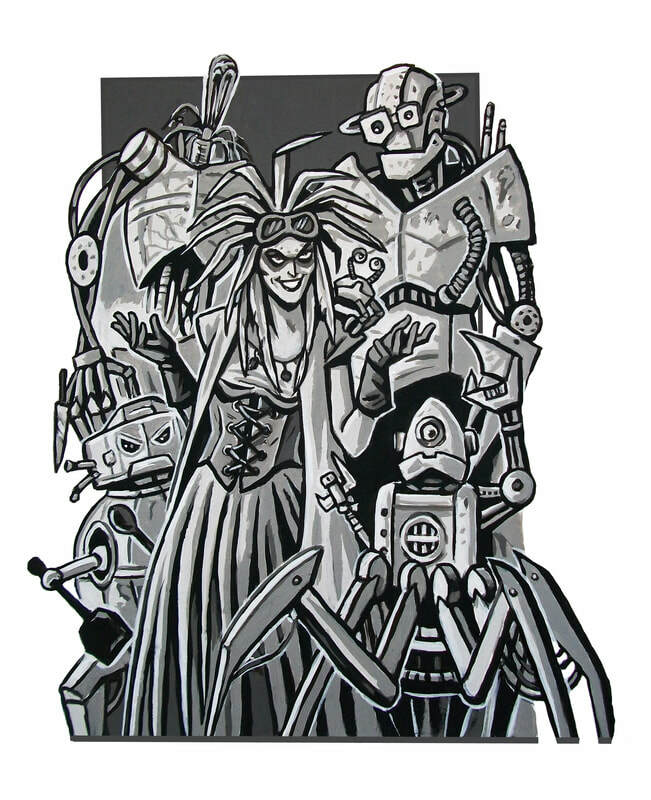 Her menagerie of hand-assembled cybonic units, known to her as groids, have been fashioned in all shapes and sizes ranging from a large rat to an oversized dog, and are equipped with pincers, saw blades, and various sharpened culinary utensils. While relatively basic cybonic drones, these speciality Murder Groids are capable of following commands such as "kill", "eviscerate", and "decorate my Christmas tree with those entrails over there". Runcible unleashed her murderous creations upon Commander Broadchest and Ensign Benson during the festive season, chasing the former off the Jolly Good and into a crash-landing on the frozen moon of Ibis II. One of those who survived the encounter was MG-37, nicknamed Mags, who went on to scream its head off throughout Runcible's attempt to tear a hole in the fabric of reality to have a chat with an old acquaintance.